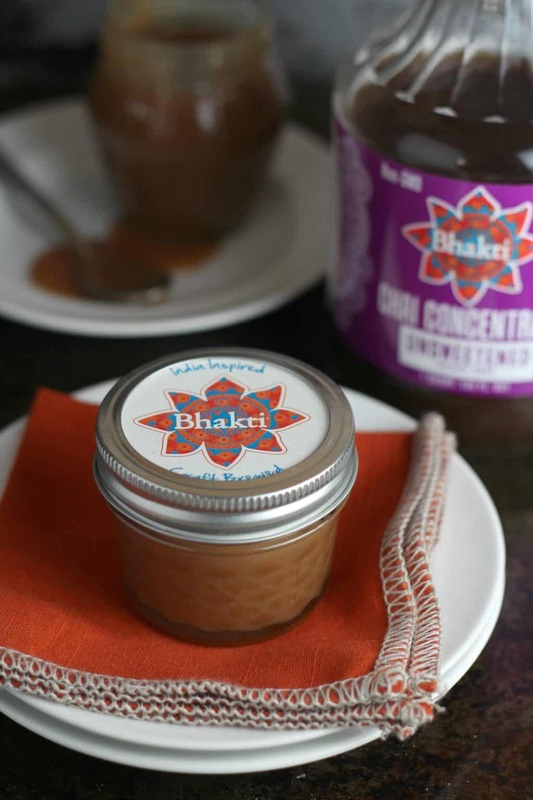 Bhakti Caramel Sauce is a recipe developed with Bhakt’s Chai. I had the pleasure this week of touring the manufacturing facilities of Bhakti, a Colorado-based beverage company whose small beginnings in the company founder, Brook Eddy’s kitchen, have blossomed into national distribution of their Iced Chai, Chai Concentrate and Sparkling Teas. Bhakti means devotion through social action and this core belief is reflected throughout the business. Ingredients are sourced worldwide with sustainability and quality as top priorities. Take any one ingredient– the tea, the ginger, the organic spices– and you’ll find that Bhakti cares about more than just the bottom line; they care about the people who harvest it, the land on which it is grown, the communities where the workers live. Read more here about the company’s sustainability. Brook explained that Bhakti is a B Corp, which is all about companies coming together to better the world through good business practices. The list of positive effects that Bhakti is creating seemed to go on and on. I was so impressed by how much Bhakti cares about making a difference in the community here in Colorado and far-reaching around the world. Their dedication reminds me that each of us could take small steps in our own daily lives to contribute towards the betterment of our world. All of this good will towards positive change is supported by Bhakti’s drinks– spicy chai & chai concentrate, bubbly & refreshing teas. Brook told us about her experience in India where she was introduced to chai. All types– chai can be found on the busy city streets, on the train, in restaurants and especially in people’s homes. Each family took pride in their blend of spices. 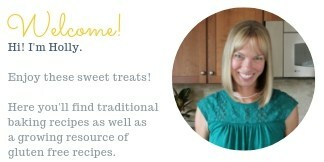 Brook takes the same pride in Bhakti’s recipes. It is the spices and the ginger that sing in Bhakti’s drinks. We sampled a small taste of the pure ginger juice in the manufacturing facility and–wow!–it literally is a shock to the senses! That ginger is skillfully combined with black tea, spices and almond or soy milk and made into delicious blends. 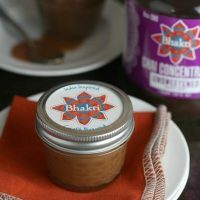 I took the deep, spicy flavors of the unsweetened chai concentrate and made this Bhakti caramel sauce. Three ingredients come together to create something special. The sauce has a slightly mysterious quality of tasting deeply flavorful while you can’t quite put your finger on the secret ingredient. Yes, the no-so-secret ingredient is Bhakti, but you’ll know what I mean when you try the caramel sauce. You can drizzle this sauce over fresh fruit, Greek yogurt, oatmeal, ice cream…or you can simply indulge in eating it right off the spoon. Look how much fun it is to dress up a tiny mason jar with a Bhakti sticker; it makes a great gift too. The deep, spicy flavors of the unsweetened chai concentrate and made this Bhakti caramel sauce. Three ingredients come together to create something special. Add the Bhakti Chai Concentrate Unsweetened and the sugar to a large saucepan. The mixture will eventually bubble up and need plenty of space so please start with a larger saucepan than simply fits the ingredients. Heat over medium high heat. Stir until the sugar dissolves then let the mixture bubble up and then reduce. You can swirl or jiggle the pan every now and then. Cook until the mixture starts to caramelize; it will darken in color. This stage takes about 8-10 minutes. Turn the heat down to medium. Take the saucepan off the heat briefly while you add the cream. Whisk continuously. Allow the caramel to heat for another 2-3 minutes. 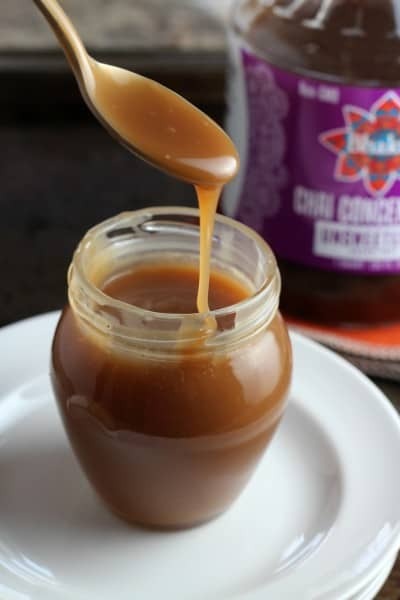 If you have a thermometer let the caramel reach about 225 degrees F. Otherwise judge by sight-- the caramel will still be runny while hot but will have thickened slightly. Take it off the heat and fill clean, prepared glass jars. Let cool to room temperature then refrigerate. This is a sponsored post. All opinions are my own. A sincere thank you to the kind people at Sprouts and at Bhakti. Thanks for investing your time and sharing your valuable knowledge with a group of bloggers this week. Great post Holly! It really is a great company and a great product! So fu to go up there with you! Have a great vacay! I missed this event. If I had known you would be there, I would have gone too. 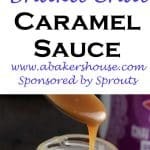 This caramel sauce sounds delicious! !